It seems that during the eighteenth century, whenever there was a revolution, Freemasons were not far away. The American Revolution had many masons leading the cause and with the outbreak of the French Revolution in 1789, Freemasons were again leading various factions, with Louis Philippe II, Duke of Orleans, Grand Master of the Grand Orient, being prominent. But Freemasons were divided, their differing views and loyalties challenging not only the course of the Revolution, but the perception of Freemasonry in France and around the globe. Masonic symbolism featured prominently in revolutionary propaganda; in official pamphlets symbols like the All-Seeing Eye and the Plumb-Rule were used to portray the supposed enlightenment and justice brought about by the French Revolution. The Enlightenment itself, brought to prominence by writers like the Freemason Voltaire, influenced the origins of the Revolution with works with masonic links, such as Thomas Paine’s The Rights of Man, being written in its support. The Revolution however, descended into violence and political turmoil, the enlightened road of liberty being a long and blood stained one, with an estimated 15,000-40,000 people being guillotined – the guillotine being named after Dr Joseph-Ignace Guillotine, physician, Assembly Member and Freemason. Louis Philippe, Duke of Orleans, visited England frequently. He was friends with the Prince of Wales, who had also served as grand master of the English ‘Moderns’ Grand Lodge. Louis Philippe held liberal views and was despised by Marie Antoinette, the royal court being suspicious he was after the throne. French politics was in desperate need of reform, the Estates-General, the representative assembly, consisted of the First Estate (the clergy), the Second Estate (the nobility) and the larger Third Estate (the common people, landowners, merchants and professionals). Agitation within the Third Estate mounted in 1789 when a group of liberals demanded change. At this time Louis Philippe led the liberal minority in the Second Estate. He subsequently led a small group of noblemen to join the Third Estate, which declared itself the National Assembly in June 1789. Louis Philippe became known as Philippe Egalite and medallions were minted with his image showing the title Pere du Peuple (father of the people). He became an obvious choice to replace the King, but his position was weak. The King’s attempt to escape in June 1791 changed the position for constitutional monarchists and Louis Philippe voted to execute Louis XVI, perhaps in an effort to distance himself from the King and to save his own life. But Louis Philippe became implicated in a plot involving his son who planned to overthrow the revolutionary government and was guillotined November 1793. The Marquis de Lafayette was a nobleman who also left the Second Estate to join the Third, securing his place as a leader of the Revolution. Despite the fact that they were both Freemasons, Lafayette and Louis Philippe were far from close. Lafayette, previously involved in the American Revolution, subsequently embraced the French Revolution, supporting liberal reforms whilst remaining aware of the need of constitutional monarchy. He was elected vice-president of the National Assembly and head of the Paris Militia (later the National Guard) after pacifying the mob who had stormed the Bastille on 14 July 1789. Lafayette supported religious tolerance, freedom of the press and the gradual emancipation of slaves – his passion for the reforms being shown in his promotion of the Declaration of the Rights of Man and of the Citizen which was adopted by the National Constituent Assembly in August 1789. Lafayette’s devotion to reform and the Revolution did not stop him from gaining critics, one being Freemason Jean-Paul Marat. As a nobleman and a monarchist, Lafayette was open to criticism and his actions in ordering the National Guard to open fire on a mob in Paris in July 1791 escalated feelings against him. He was declared a traitor by the Assembly in August 1792 after rumours of his planning to march on Paris to overthrow the revolutionary government. Lafayette, who had been in command of armed forces preparing to attack Austria, took refuge in Liège where he was subsequently imprisoned for five years despite the call of the United States for his release. He was freed in 1797 but Napoleon blocked his return to France until 1799. Despite his hardships, Lafayette always remained a liberal and a supporter of the rights of man. Marat was a physician who had visited England in the early 1770s, and it was during this visit that he was made a Freemason in London, with a Grand Lodge certificate of his membership being issued on 15 July 1774. He held staunch liberal views and wrote the ground breaking Chains of Slavery, published in Newcastle in 1774. He returned to France, where he worked as a physician. On the eve of the Revolution he wanted to influence the progression of the Third Estate, and published pamphlets and newspapers constantly criticising those in power. He was nearly arrested for his belligerent campaign against fellow Freemason Lafayette. His views became so embittered, attacking the powerful and criticising the National Constituent Assembly, that he had to go into hiding in the cellars and catacombs of Paris. 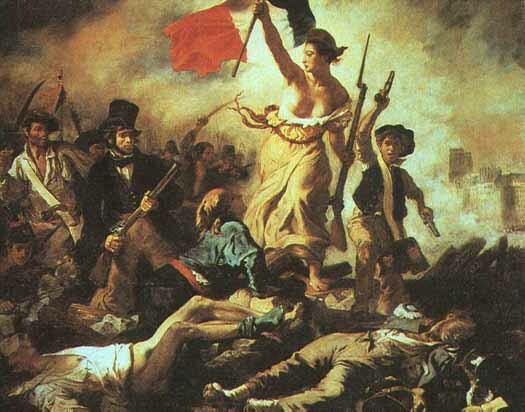 After the revolutionary Paris Commune had started an insurrection on 10 August 1792, the Legislative Assembly which had been formed in support of constitutional monarchy, collapsed and Louis XVI was imprisoned. The Legislative Assembly was dominated by the Girondins, liberal republicans who included such free thinkers as Thomas Paine. However, their cautious stance on the execution of the King sealed their fate as ‘royalists’. The radical Jacobins took control and a list of opponents was drawn up. Marat came out of hiding and was elected to the National Convention. He bitterly attacked opponents of radical republicanism, especially the Girondin faction, his fierce propaganda being used by radicals such as Robespierre. The Girondins collapsed in June 1793 and Marat had outlived his usefulness. He was assassinated by the Girondin Charlotte Corday the following month, stabbed while in his bath. She was incensed by the execution of Louis XVI. Marat’s death led to thousands of royalists and Girondins being executed. These three Freemasons all had a leading role in the development of the revolution, though they failed to work together and took different sides as the revolution developed. Only Lafayette survived to see the restoration and the end of Napoleon, but he suffered sacrifices for his liberal views. Marat seems to have been overwhelmed with bitterness, attacking Lafayette for being a monarchist and being a member of the nobility. Louis Philippe, the Grand Master, seems to have been forever tainted with a desire to gain the throne for himself, voting to execute the king and even condemning his own son for the plot to march on Paris. Napoleon Bonaparte had been a supporter of the radical Jacobins, and rose swiftly through the ranks of the French military. He gained prominence after defeating a royalist insurrection in October 1795 and was swept into power in 1799 as First Consul, five years later crowning himself Emperor of the French. There is no evidence that Napoleon was a Freemason although four of his brothers were: Joseph who Napoleon made King of Naples and Sicily in 1806 and King of Spain in 1808; Louis, King of Holland in 1806; Jerome, King of Westphalia in 1807; and Lucien, Minister of the Interior. Napoleon placed his four brothers in prominent positions controlling masonry within the Empire: Joseph became Grand Master of the Grand Orient, and Louis, Deputy Grand Master. Jerome was made Grand Master of the Grand Orient of Westphalia and Lucien was a member of the Grand Orient of France. This certainly suggests that Napoleon might have considered Freemasonry a potential threat to his rule. Because of the involvement of Freemasons in the French Revolution, Freemasonry has become forever linked with revolutionary ideals with many modern writers suggesting that the Freemasons in France were behind the Revolution itself. The differences behind these masonic figures suggests otherwise; it reflects the complexity of the Revolution and how different political ideas conflicted with personal ideals.